Digging around in an 1851 edition of The Monthly Journal of Medical Science, I stumbled across a long and rather dry article about Roman medicine by a Dr Simpson, professor of midwifery at the University of Edinburgh. 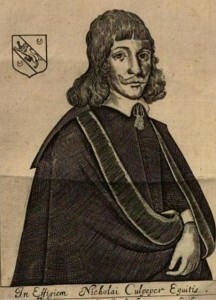 His narrative is enlivened by a list of bizarre remedies favoured by Roman doctors. 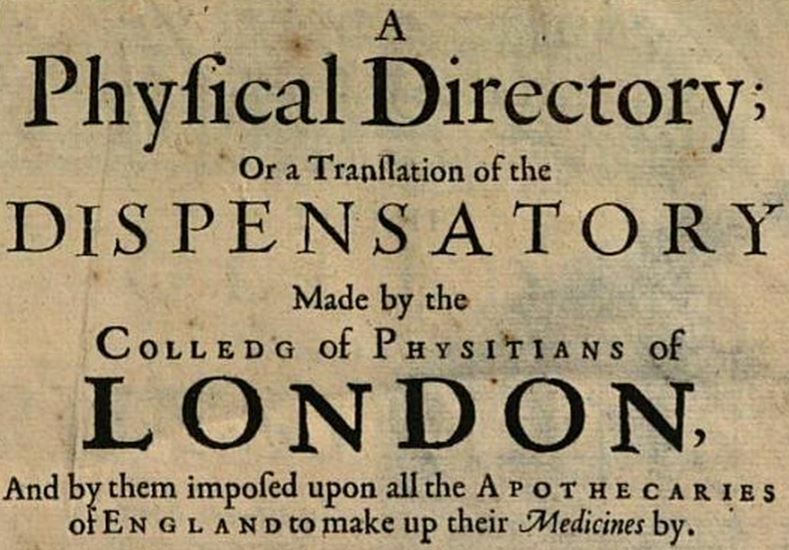 He then points out – rather in the manner of this blog – that English medics were still recommending ridiculous medicines as recently as the seventeenth century. In its catalogue of simples it includes, for example, as medicinal remedies, eleven varieties of excrements, five varieties of urine, fourteen kinds of blood, seven kinds of gall, saliva and sweat, the sperm of the frog and seal; mummified men; the os triquetrum from the human skull; old castrated cats; ants; crickets; millipedes; &c.
Therefore consider that the College give the Apothecaries a Catalogue of what Parts of living Creatures and Excrements they must keep in their shops. 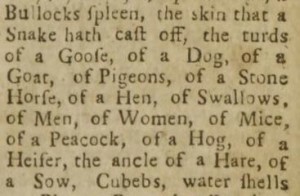 The Fat, Greese or Suet of Duck, Goose, Eel, Bore, Heron, Thymatos (if you know where to get them), Dog, Capon, Bever, wild Cat, Stork, Coney, Horse, Hedge Hog, Hen, Man, Lyon, Hart, Pike or Jack, (if they have any, for I am perswaded ‘tis worth twelve-pence a grain) Wolf, Mouse of the Mountain (if you can catch them) Pardal, Hog, Serpent, Badger, Gray or Brock, Fox, Vultur, (if you can catch ‘em). At last! An ingredient I could pick up at the supermarket. Butter, that is, not dog turd. Cheese, madam? Yes, you’ll find it in the aisle between viper’s flesh and bladder stones. This latter seems a tall order, but at this date refers not to the mythical beast but to the narwhal, whose horn bears a striking resemblance to that of the unicorn. If every apothecary in the country was expected to stock this item, there must have been lively demand for the bodies of murder victims. Culpeper seems to be on the point of rebellion: even he admits that the thing he’s expected to stock doesn’t exist. A degree of repetition enters the list at this point; but if you’re going to buy one sloughed-off snakeskin you might as well have two, I suppose. 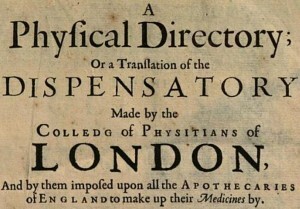 Can you imagine what the average apothecary’s shop must have smelled like in the seventeenth century? the Piss of a Boar, of a Shee Goat, of man or woman that is a maid, the moss on a mans skull. This final item is rather interesting: a species of lichen which grew on skulls exposed to damp air was believed to have curative powers. The animal remedies in the Pharmacopoeia make up only the first section of a much longer document: when you take into account the herbs, fruits and roots they were also directed to stock, you start to realise that being an apothecary was not a straightforward (or cheap) business.